If you’ve never paired these two glorious things together, grilled cheese is the perfect vehicle in which to try. 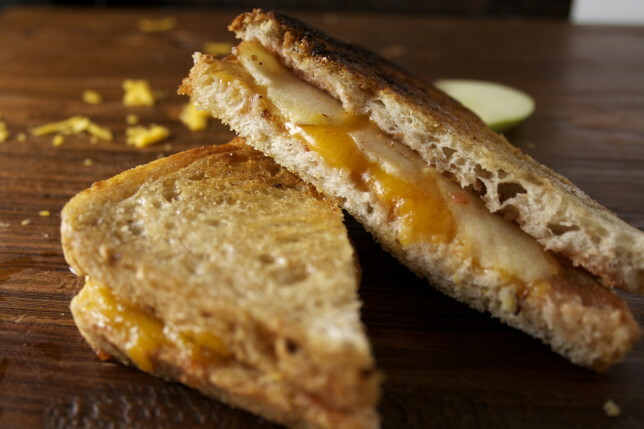 There’s no simpler meal than bread and cheese. Toasted and melted and you’ve turned any bad, rainy day on its head. Add thinly sliced apple to the equation, glued together with apple or pumpkin butter, and your meal is utterly transformed. 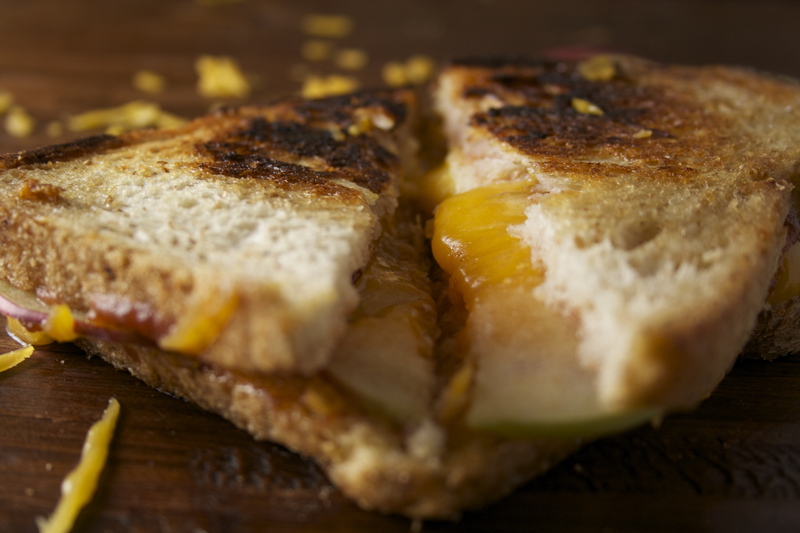 The bite of the cheddar — because we use extra or seriously sharp — marries so perfectly with the crisp, tart sweetness of the apple. Any variety will do. Use your favorite. This is comfort. The schmear of apple butter — or pumpkin butter, when we have it — adds another layer of sweetness, a layer of spice. Here in New York we’re on our third day of clouds and chill and rain. Truth be told, maybe it’s a little too cold, this jump from 80 to 50-something. But I’m not complaining. I’m not allowed, after despairing over the summer heat. I hear there may be a hurricane on its way as well. So far, so good. We can make it. I say we all huddle together inside the web and shelter ourselves with mouthfuls of melted cheese, telling jokes and laughing about that stupid thing your cat did. I’ll throw in a donut or two for dessert. Who’s with me? 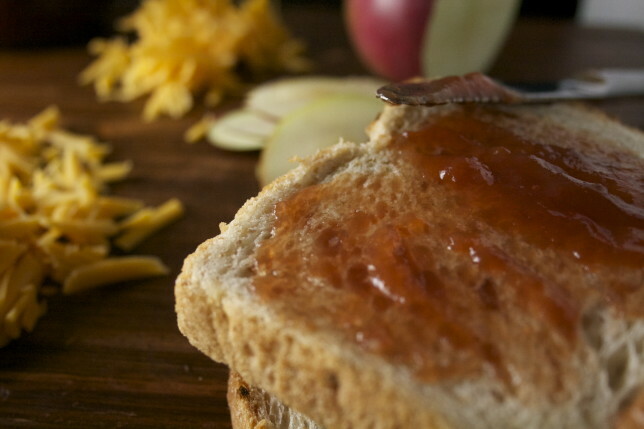 Schmear your apple or pumpkin butter on each slice of bread. 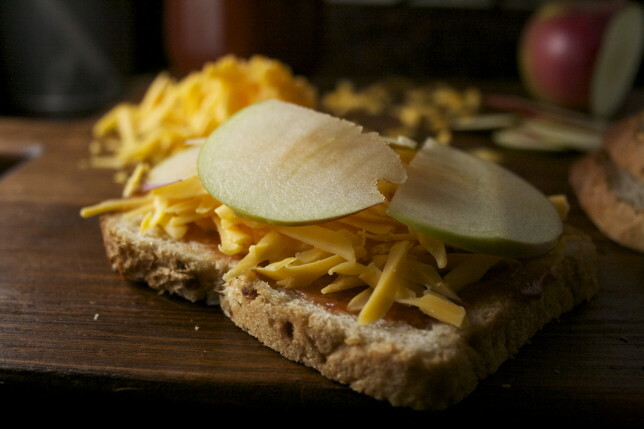 Layer half the cheese on two of the slices, then add apple in a single layer. Complete each sandwich with the remaining two slices of bread. Heat a glug or two of olive oil and a tablespoon of butter in a large skillet over medium heat. Place sandwiches in the skillet and let cook until the bottoms are golden brown. Remove from skillet and add a bit more olive oil and another tablespoon of butter. Flip the sandwiches so the uncooked side is on the bottom. Turn the heat to medium-low. 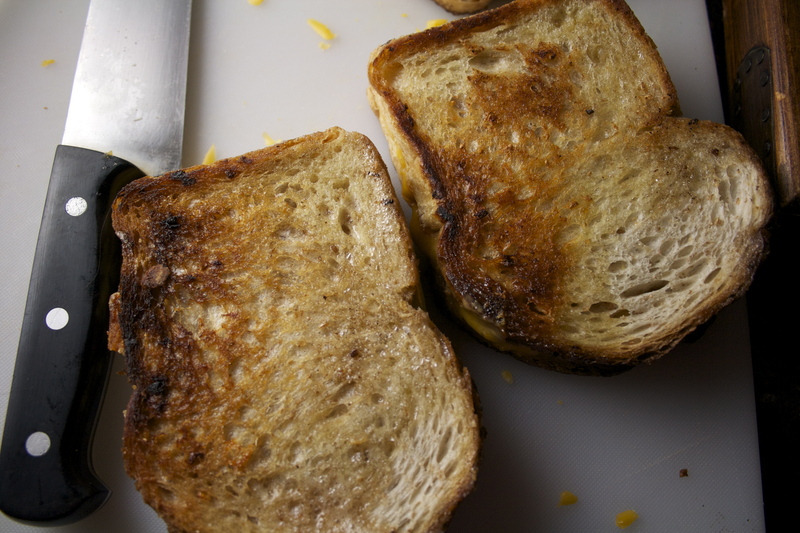 Cook until the bottom is golden brown and the cheese is melted. Remove, cut in half, and serve. Preferably with a bowl of tomato soup.